The concept for the PLSS was championed by Thomas Jefferson as part of his goal to develop a nation of “yeoman farmers”, each of whom would make a living on 160 acres they owned themselves. The Federal Government would subdivide its lands for this purpose. For a history, see the book “Measuring America: How an Untamed Wilderness Shaped the United States and Fulfilled the Promise of Democracy”. -Andro Linklater -Walker and Co., 2002. While lands in the eastern states were irregularly partitioned and described by “metes and bounds”, the PLSS was begun in Ohio in 1785 and extended westward through other unsurveyed lands to the Pacific Coast and Alaska. A series of Principal Meridians and Baselines control the surveys in parts of all of these states. Small areas in Wisconsin that had been settled or granted prior to the PLSS were not surveyed. Generally, these lands are a result of early French settlement (e.g., Green Bay and Prairie du Chien) where long narrow lots with a bit of water frontage were commonly established, or where land grants (e.g., Green Bay area) or some Indian Reservations were established (e.g., Stockbridge). When Wisconsin was admitted to the Union as state in 1848, PLSS field work here had been underway for 17 years (while the area was part of the Michigan Territory until 1836 and then the Wisconsin Territory), but it would take almost 20 more years to complete. Wisconsin’s Capitol building is said to be the only state capitol located exactly on a section corner. 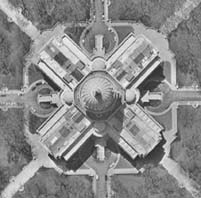 (The common corner of sections 13,14, 23, and 24 of T7N, R9E is said to be at the center of the Capitol rotunda). Gene Shepard, the 19th-century creator of the fictitious Hodag, a fierce creature now immortalized as the mascot of Rhinelander, claimed to have captured a specimen in Section 37 of a township in the area. Of course, there never are more than 36 sections in a PLSS township in Wisconsin. PLSS townships (sometimes incorrectly called “towns”) often cover the same area as a civil Town (the form of local government for all areas not incorporated into villages or cities). This is especially true in the southern half of the state; in less-populated areas of the north, a civil town is often at least 50 square miles and sometimes over 100. Civil towns are named (e.g., Town of Harrison, or Town of Springbrook), and a town always is completely contained within a single county. The same town name may be used in multiple counties (e.g., Town of Union). By contrast, while county boundaries often do follow PLSS township lines, this is not always the case. Sometimes a water body (e.g., Wisconsin River) separates two counties, but in other cases a township is split across adjacent counties. For example, T39N R10E is divided between Oneida and Vilas Counties. Note that while the term “Civil Town”, means a governmental unit for a large rural area. The more generic term “town” may be used casually to mean any small settlement regardless of whether that settlement is legally incorporated (e.g., a village or small city) or not. The “Initial Point” for Wisconsin’s PLSS, along the Illinois border where the 4th Principal Meridian heads off northward and the baseline extends west the Mississipi River and east to Lake Michigan, has been marked with a special monument. A nearby historical marker along State Highway 84 commemorates the beginning of the PLSS in Wisconsin. The 4th Principal Meridian actually begins in west-central Illinois. Most of Wisconsin’s boundary is defined by bodies of water: the Great Lakes and St. Croix and Mississippi Rivers. There are four “straight” pieces of boundary that cross land. The most of obvious is the southern boundary with Illinois which follows a PLSS boundary. The north-south line bounding the west sides of Douglas and Burnett Counties also follows a PLSS range line. However, there are two other straight stretches of boundary that cut across at an angle the normal PLSS grid. These two lines, which join at a point of deflection in Lac Vieux Desert (the source of the Wisconsin River on the border with Upper Michigan), form the northern borders of three counties – parts of Forest and Iron, and all of Vilas. This situation results in partial PLSS sections all along that boundary. East-central and north-eastern Minnesota has PLSS tiers and ranges extended westward from Wisconsin. The balance of Minnesota is based on the 5th Principal Meridian and a baseline far to the south, so when comparing across the Mississippi River into south-eastern Minnesota, town numbers there are higher than those for abutting towns in western Wisconsin. A number of other states are also divided into areas each of which is controlled by a different Principal Meridian. By contrast, Wisconsin’s PLSS is entirely referenced to the 4th Principal Meridian. PLSS surveys were done under different Earth magnetic field conditions than exist today. It is possible to determine (approximately) the Earth’s magnetic field in prior decades, so one could reconstruct the declination at any particular location at the time that PLSS surveyors were operating in an area. Our section on magnetic declination explains how this is done.